Paddington bear has made a come-back and is very popular at the moment so I have devised a delicious cake using marmalade in his honour. Now is the season for oranges especially the Sevilles, so buy a chunky marmalade made from them. You will need a deep 7in /18cm cake tin and a pastry brush for glazing. In a mixing bowl put the fat and soften it with a wooden spoon. Add the sugar, sieve in the flour and baking powder, then add the eggs, marmalade and the grated zest of the orange. Mix with the wooden spoon for 2-3 minutes until well blended together. Put into the tin and bake for approximately 40 minutes, or until firm in the centre. Turn out onto a cooling rack. Decoration: Cut the orange into thin slices. In a wide pan melt the sugar in 300ml / ½ pint water. Bring to the boil, put in the orange slices. If the orange is large cut the slices in half but leave a whole one for the centre. Turn down the heat and gently simmer for approximately 10 minutes to soften the peel. Melt the marmalade with 1 tablespoon of syrup over a gentle heat. Do not boil. 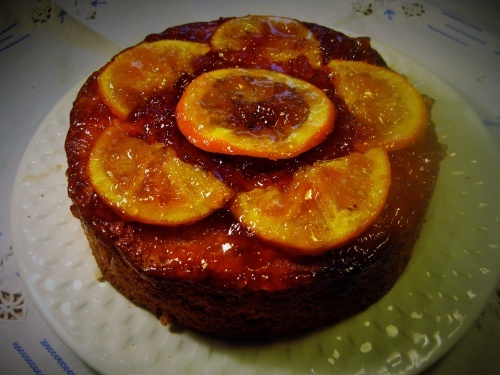 Brush it over the cake then place the orange slices on top and brush them with the hot marmalade.